"Appalachia" is an amorphous and unwieldy term. It has seen multiple definitions since around the time of the US Civil War. The most popularly accepted of these definitions is that of the Appalachian Regional Commission (ARC), a by-product of Lyndon Johnson’s War on Poverty in the nineteen-sixties. The Commission defined Appalachia as a string of four hundred twenty counties in thirteen states, from southern New York to Mississippi, vaguely tracing the lines of the Allegheny, Cumberland, and Blue Ridge Mountains, respectively. 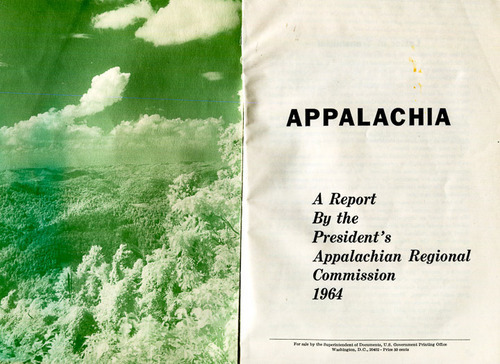 This definition, however, is dismissed by many due to the political nature of the efforts of the ARC, whereby many generally perceived “non-Appalachian” counties were included in the regional definition in response to the concerted efforts of state governors to gain the relief funds offered up by such status. It becomes apparent here, that even in attempting to define a concrete, physical outline to the region, this seemingly simple task becomes distorted by outside discourse of power and flow of government aid. In a sense then, the geographic question is reframed to instead be understood as, to be “Appalachian” is to be “in need,” rather than to exist in any physical space. I have a lot of obvious problems with how the ARC functions in terms of power and aid distribution. How do you define Appalachia?